Which Water Tank Material is Best? Rainwater tanks come in a lot of different sizes, shapes and materials. This article covers some advantages and disadvantages of the most commonly used materials in rainwater tanks. Decide for yourself which type of water tank best suits your needs. Fibreglass tanks need a food-grade coating to be up to Australian standards for storing water. They are very stiff and rigid, but relatively thin and light, making them quite brittle and prone to cracking. They also allow more light entry and are often darker coloured to reduce algae growth. The quality of a fibreglass tank depends on its maker, so make sure to check the quality thoroughly before choosing this material. Most steel water tanks are made of galvanised steel—a zinc coating that protects the steel from corrosion. These tanks can be built to hold capacities from about 30,000 litres to millions of litres of water. This makes them a suitable solution for extremely large storage requirements. Galvanised steel over time however still rusts and corrodes, and the zinc can leak into your water leaving your stored water tasting metallic. To help overcome this issue most steel rainwater tanks come with liners made of food-grade polyethylene. These can be quite expensive to fabricate, and over time can break and require repair. Stainless steel tanks don’t have many of these issues, but then such are a lot more expensive that often make them less feasible. Concrete tanks are quite strong and often long lasting. Unfortunately, the introduction of reinforcing steel into concrete has created a new problem that affected the durability of concrete tanks. When embedded reinforcing steel corrodes, it can cause concrete to crack and break. Lime, which is found in concrete, can also leak into the water. They are generally installed underground for commercial purposes, but can be used for residential use as well. Polyethylene is one of the most popular water tank materials today for many good reasons. Since this is what National Poly Industries sell we obviously have a lot more to say – but will nonetheless try to remain neutral. poly tanks are non-corrosive so won’t taint your rainwater with fibres. There is one drawback however that is easy to overcome. While poly tanks do not leak lime like concrete tanks, or zinc like steel tanks can, one must still be careful if they have copper plumbing throughout their home. Rainwater is naturally acidic and can cause copper to leak into the water if left in the pipes for some time. This issue is more common with rainwater collected in plastic and plastic-lined water tanks since concrete tanks leak lime which actually reduces the water acidity. This is something that can be avoided, and which you want to avoid for you and your family’s health. Dissolved copper in drinking water can cause gastric problems and headaches, and in severe cases cirrhosis of the liver. You can easily treat your tank water to be less acidic, apply proper filtration at the tap or simply flush the first seconds of water out of the pipes that you drink or cook with. 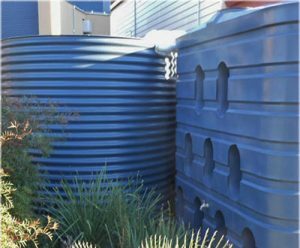 Poly tanks haves quickly become the choice for Australian rainwater tanks. They can be found in storage capacities of up to about 50,000 litres. Polyethylene is also recyclable and reusable, making them the green material of choice in the 21st century.